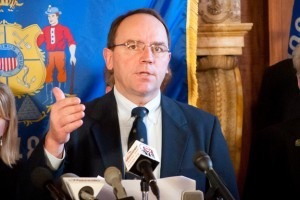 Republicans in the Assembly introduced legislation that would change the process of obtaining iron mining permits at a press conference Thursday. The drafted bill would provide a timely process for the state to issue a mining permit. The bill is designed to make Wisconsin more welcoming to metallic mining companies, particularly Gogebic Taconite (GTAC), who owns over two billion tons of iron ore in Wisconsin's Ashland and Iron counties. GTAC is currently working on the permitting process. The bill would then require mining companies to complete a three stage process, which would take at least two years to complete, compared to the uncertain timeline currently in place. "We need to make a decision as a state whether the miner on our flag is going to be part of history or part of our future. This bill is all about making that miner as part of our future," Rep. Tom Tiffany, R-Hazelhurst said. This bill is expected to supply more than 2,000 permanent jobs to northern Wisconsin, stimulate manufacturing jobs in Milwaukee and enable up to $1.2 billion in annual economic impact, according to the bill's supporters. However, the drafted mining bill, though depicted as bipartisan, is seen by some as a "secret" bill, excluding public input and weighing an agenda for mining companies. "My concern is that the governor's mining bill is just another corporate special interest giveaway," Rep. Brett Hulsey, D-Madison, said. "This bill was written in secret by corporate lobbyists." The bill is also being criticized by environmental groups, including Sierra Club, for its lack of concern for environmental responsibility concerning water and air pollution. But according to Assembly Speaker Jeff Fitzgerald, R-Horicon, "This is really a streamlined process creating a permission process and a timeline without compromising environmental integrity.